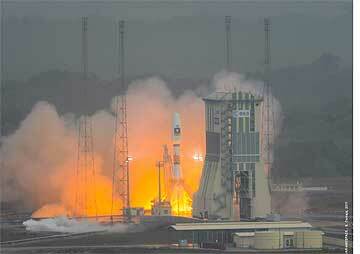 [SatNews] Guiana Space Center in French Guiana, near the Equator is hot with activity. 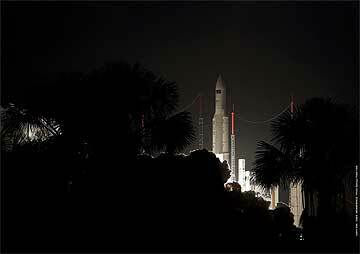 For the first time in the history of Arianespace, the company's operating teams were all deployed concurrently on the Ariane, Soyuz and Vega launch pads at the Guiana Space Center in French Guiana, near the Equator, for three launch preparation campaigns. The cryogenic main stage for the Ariane 5 ES launcher was erected in the Launcher Integration Building, along with its two solid boosters. The 61st Ariane 5 launch will send an Ariane 5 ES rocket towards the International Space Station (ISS) with the third ATV (Automated Transfer Vehicle) cargo vessel, designated Edoardo Amaldi. 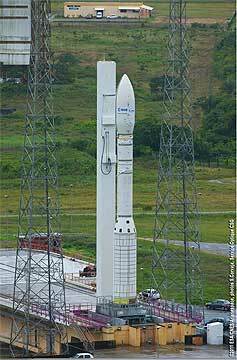 This is the third Ariane 5 ES to be launched, following the first two ATV launches in March 2008 and February 2011. The Edoardo Amaldi ATV launch is scheduled for March 2012. The second launch of a Soyuz rocket from the Guiana Space Center, planned for December 16, will orbit six satellites: the Pleiades observation satellite and four Elisa auxiliary payloads, all for the French government, along with the SSOT Earth observation satellite for Chile. The first three stages on the Soyuz launcher have already been assembled horizontally in the MIK Launcher Integration Building, while the Fregat upper stage was transferred on Friday from the MIK to the S3B building, where propellants are now being loaded. Preparations for the first launch of the new Vega light launcher kicked off on November 7 with the transfer of the P80 stage from the Booster Integration Building (BIP) to the Vega Launch Zone. 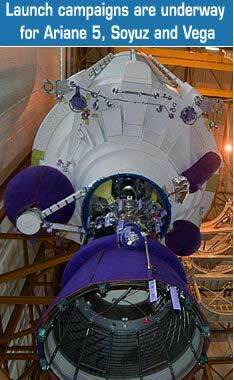 Vega will orbit the Lares satellite and several microsatellites during its maiden launch, scheduled for January 2012. With Ariane 5, Soyuz and Vega all being operated from the Guiana Space Center, Arianespace is the only launch service company in the world able to launch all types of payloads to all orbits, including communications satellites, scientific satellites, Earth observation satellites, constellations and spacecraft to service the International Space Station. A total of 18 payloads are being prepared in the Guiana Space Center's clean rooms for these three upcoming launches, from the smallest (a CubeSat, weighing less than 1 kg), to the largest (the Edoardo Amaldi ATV, weighing in at more than 20 tons). At the same time, Arianespace and Starsem teams are deployed at the Baikonur Cosmodrome in Kazakhstan to prepare for the Soyuz launch in early December that will orbit six satellites in the Globalstar-2 constellation.